Bring balance and calming energy to your home with these scented soy candles. Set the right mood for your morning sun salutations, intense bikram, or restorative vinyasa with Amina Ahmad's hand-poured soy candles. They're scented with essential oils and have recycled, paper-braided wicks that burn clean and bright, filling rooms with evocative aroma blends. Each one is paired with a complementary mantra or yoga pose to enhance your practice and present state. Handmade in Washington, DC, from USA-sourced materials. Savasana (lavender and eucalyptus): a calming and cleansing blend to help you rest and rejuvenate. Soothe the Soul (aloe and green tea): a blend with a delicate, earthy scent to entrance the mind and mellow the mood. Warrior (sweet orange bergamot): a powerful blend to stimulate the brain and give you a fierce sense of purpose. Amina Ahmad realized she held a flame for candles early in life. She grew up in the rolling hills of Maryland and spent her days sketching flowers by candlelight. After studying Environmental Science and Policy, she discovered the toxic effects that candles can have on the environment, home, and our bodies, and started making her own in her college apartment. Her creations purely illuminate the home, uplift the spirit, and inspire the soul. Never leave a candle burning unattended. Avoid burning near open windows or in drafty areas. Keep out of reach of children and pets. Trim wick .25" each time candle is lit. The scent is wonderful and I can't wait to purchase this again! My friend, the gift recipient, loved the candle and stated that the essential oils were subtle and not too over powering. She found the gift soothing and peaceful. Surprised a friend and she was so happy. It was a successful gift. This is only the second candle I have ever had in my life because I have an extremely sensitive nose and also hate artificial scents like perfumes and deodorizing sprays. This candle was a pleasant surprise to my nose, the smell is not strong at all but still noticeable. Most importantly, it didn't give me a headache! I like it's sleek design, that it is all natural, and has lasted a long time. The lavender scent it gives off is very relaxing (I bought the Savasana). I actually just purchased my second one! 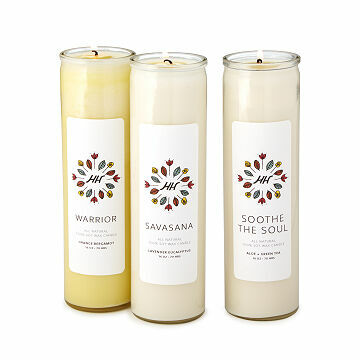 I ordered the Savasana candle for a friend, and she absolutely loves it. The smell is very soothing and relaxing. She had recently started her personal yoga/meditation practice, and she uses this candle daily to enhance her quiet time. The smell for the warrior candle is delicious and the design is very sleek. I love the scent of this candle. It isn't too strong and perfect for setting a relaxing mood before settling into bed. Love this gentle yoga candle! The scent is not overwhelming, quite pleasant. These are so beautiful! You begin with lovely packaging, to open up and find a lovely scented candle in an equally beautiful design. I had fun selecting the right scent for each of my adult children.